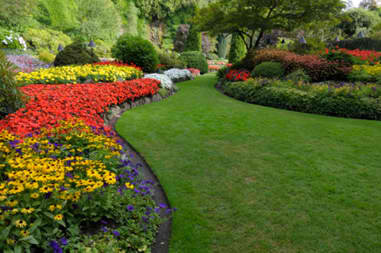 Want your landscaping beds to look their best spring, summer, and fall? Give us a call or fill out a request for an estimate on our Bed Maintenance Service for your home today. Our trained and professional landscape maintenance techs will spruce up your landscaping and keep it looking great throughout the entire season! 4-Step Flower and Shrub Fertilizer Plan: Organic plant and flower nutrient applied over the course of our 4-Step Program to all flower and shrub beds. This program enriches your soil, increase nutrient uptake, and get the best performance and flowering out of your plants, shrubs, and flowers!! 2-Step Landscape Weed Preventer Plan: This application kills broad leaf and grassy weeds before they germinate and protects from future weed problems for up to 3 months. It is a granular product applied to landscape and mulch beds. This product will not eliminate weeds altogether but will reduce new weeds from forming by about 75%. Spring and Fall edging and re-shaping of landscape beds. Trimming of shrubs, hedges, and bushes once in the summer and once in the fall.